Gillingham manager Andy Hessenthaler says he is happy to help Kent League side Hythe Town prepare for their FA Cup first round tie with Hereford. Hythe are the lowest ranked club left in the competition and meet the Bulls, who Gillingham drew 0-0 with in August, at Edgar Street on 6 November. 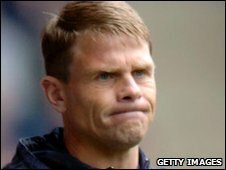 "I'll give them as much information and as many DVDs as I can on Hereford," Hessenthaler told BBC Radio Kent. "I want them to get through to the second round." Although Hythe lie in the ninth tier of English football, five leagues below Hereford, Hessenthaler has warned the Bulls that the Reds should not be underestimated. "I was on the end of a cup defeat at Hythe when I was at Dover," added Hessenthaler. "They've got a togetherness that's pulling them through." "If I can be of any help I will put my assistance to them. Give me a call."